This blog started as a cracking bit of therapy-based wordplay that was begging to be made into a blog title. 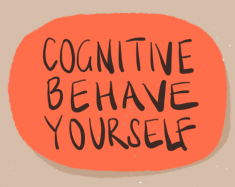 From there I developed the formula: road-test the techniques frequently used in Cognitive Behaviour Therapy (CBT) by experimenting with them in everyday situations, and then write about it for all who care to read about it (and happen to stumble across it). My real job is as a clinical psychologist in a specialist NHS service for anxiety, OCD and trauma. As part of my work there I set up the Misophonia Clinic, using CBT to help people to cope better with the misophonia spiral and supervising therapists around the country who are seeing people with misophonia. My official aim for this blog is that I want to better understand the torment and the triumphs of the therapy experience by giving myself a little dose of my own medicine. My unofficial aim is that I really, really want people to like me. Let the mind games commence. I hope it’s obvious that this blog is not a substitute for psychological therapy. If you feel like you need support, please speak to your GP about what services are available in your area. If you’re looking for a private CBT therapist in North-West London, look here: www.thisiscbt.com. Looking for a CBT therapist somewhere else in the UK? Click here to find a therapist through the BABCP. i stumbled upon your blog today & I love it! I’ve just finished my first year of psychotherapy training, so I’m an info junkie at the moment! look forward to reading more! Thanks Ana! It’s been a lot of fun writing it. Good luck with your psychotherapy training. Every day I feel lucky to have such an amazing and rewarding job to go to. I ran across a very thoughtful comment you made on the community mental health blog I admin, A Canvas Of The Minds, earlier this year — way back in May, as a matter of fact — about our Blog For Mental Health campaign. I was reviewing what went well with the project and what needs adjustment for the year to come. I’m so terribly sorry I am only now having a look at your blog. I love that you have both the therapist/clinician’s perspective, but so obviously respect the value of mental health consumers supporting one another. I am very excited to delve into your blog; a therapist (and human being) who cares so much for both sides of things is clearly committed to truly helping to alleviate suffering, and to encouraging wellness through all avenues, and that is a wonderful thing indeed. Thank you again, and I hope to get to know you a bit better — and even perhaps see more of you in the coming year! Thanks for your kind comments. I just think it’s great that there are more and more ways for people to communicate with one another about mental health, from all sides of the picture. A community like the one you oversee is such a significant and healthy step for everyone and I am touched by a lot of what I read. My blog has been on hiatus because of a really busy period at work but I am still doing my experiments and hope to get writing again in the new year. I am learning so much as I go and it’s sincerely changed the way I practice as a therapist.